This novel won a National Book Critics Circle Award and the Pulitzer Prize for Fiction in 2004. In 2005 it won the International IMPAC Dublin Literary Award, one of the richest literary awards for a novel in the English language. 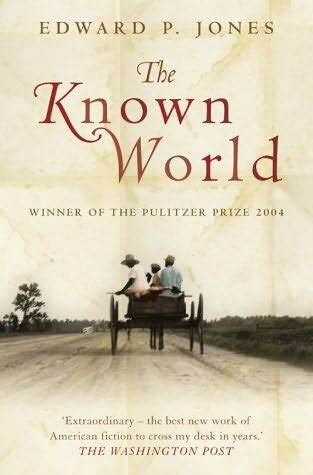 It was a finalist for the 2003 National Book Award, and in 2009, the website The Millions polled 48 critics, writers, and editors; the panel voted The Known World the second best novel since 2000. The time is in the years before the American civil War. The place is Manchester County, Virginia. That would be the antebellum South, y’all, and this stunning, heart-breaking novel, historical fiction, tells a story of slavery from a different angle. It is the story of a free Black family, starting with the patriarch Augustus, who managed to buy his way out of slavery. He and his wife Mildred had a son, and August was able to save enough to buy Mildred her freedom, and they left their son with the white owner, Robbins, working as a groom until they finally were able to buy his freedom too. Their son, Henry, grows up and purchases his first slave, Moses, and thereafter, many more slaves to work his farm. He marries another free black woman, whose parents also owned slaves. We are introduced to William Robbins, the most influential of the landowners in the county, who keeps a black mistress by whom he has two children. There is the sheriff John Skiffington, who, although a product of his time and place, tries to hold a higher moral view, and deal with the slavery issue, and the issue of human property, fairly and high mindedly. It is the story of the interplay among the white people who populate the story, the free blacks, the free blacks who own slaves, and the slaves. It is told in a rambling manner reminiscent of how people really do tell their stories, a little of this, a little of that, a little backtracking, and little of what happens to someone far in the future, all told by an omniscient narrator. It reads as if it was based on researched fact. However, it is all made up, even the facts tossed out as if they were true. It’s a wonderful voice, a flat telling, like someone sitting at the kitchen table with you talking about their family. It is tough reading in places; not because of the difficulty of the narration, but because of the difficulty of the subject matter. We humans can be awfully cruel to each other. It would seem we have to work hard at being decent, moral creatures. This entry was posted in Fiction, Historical fiction, Literary Fiction - That's the High Class Stuff.